This is a touchy subject. Oh boy, is this a touchy subject. I’m sure to offend somebody with this post. I used to be much heavier than I am today. I was heavy for a long time and my mental image of myself is of that heavy woman. I spent decades buying, and sometimes making, clothes for that heavy version of myself. Actually I still do. On the rare occasions that I buy clothes, I’m always surprised at how big they are on me. Habits are hard to break I guess. 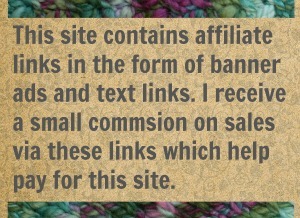 Most importantly, there is a real need for this in the knitting and crochet community. Yes, some knitters can wear a size 6 dress. Most can’t. Yes, some crocheters are spritely 19 year olds. Most are not. Most knitters and crocheters are a size 12 or larger (as are most Americans) and most are over the age of 35. The knitwear industry continues to make size-small knitted sweaters, put them on young ladies with ideal bodies, and then assure you it will look just as good in size XL. The knit-wear/crochet-wear industry treats their customers pretty much like the rest of the clothing industry and that’s just dumb. Its dumb that the clothing industry won’t show you their stuff on realistic models and its even dumber when the knit and crochet crowd copies them. Unlike a pair of jeans or a dress, we can’t return a handmade sweater when it turns out to be very unflattering. We are stuck with it. And we poured hours/weeks/months of our time into the making of that sweater. Treat this like a buffet: take the things that appeal to you and leave the rest. 1) Pull-overs and jerseys are risky. Its easier to find cardigans that flatter the female form. That’s true for women of all shapes and sizes actually. Pull-overs were initially a man’s garment and most designs still do a better job flattering a man’s form than a woman’s. Now man-ish sweaters can look cute … if made big and over-sized and then placed on young, thin women. It makes them look small and delicate and quite feminine. 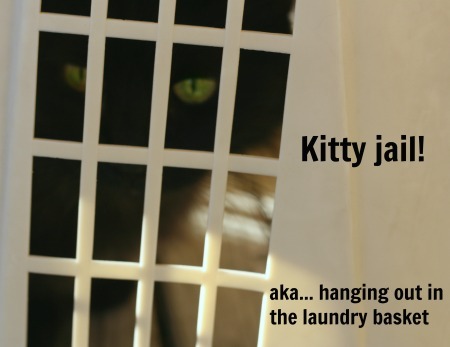 If that look works for you, you are reading the wrong blog post. This is for plus sized ladies and they (usually) need cardigans. 2) Three-quarter length sleeves will make you look taller. That is true for all women and (nearly) all women look better in their clothes when they appear taller. Full length sleeves make you look your actual size and height. Overly long sleeves make you look shorter. Short sleeves and cap sleeves make you look wider (at the shoulders). A sleeve that ends midway between your elbow wrist is what you want. 3) A form-fitting upper sleeve will show off your rack. Hey, don’t raise your eyebrow like that. If you’re plus size, you are blessed with a great chest and you know it. The sweater you have been dreaming of will be showing that off nicely. To do that, you need a tight sleeve; tight from the armpit down to the middle of your upper arm at least. Loose sleeves may be comfy (I certainly think they are) but they are not flattering. 4) High necks, boat necks, turtle necks are bad. Square necks are okay for medium size women. For plus size, go with rounded or V-necks. The wider and deeper the V-neck the better. That’s where a cardigan excels. Place your first button right at the bosom and it will make the perfect V-neck. 5) Any design elements that put an hour-glass shape on top of you are great. You want your sweater to trick the eye. Here again cardigans are very useful. A tight fitting cardi, when buttoned only at the middle will give you an instant hour-glass effect. If that’s emphasized with cables, lace or color, even better. 6) Finally, tight fitting is better than loose fitting. If your self-conscious that can be tough to accept. Believe me when I say I’ve been there. But… BUT… big clothes do not make you look smaller, they simply hide you. A form-fitting sweater will show off your curves and you do have them. 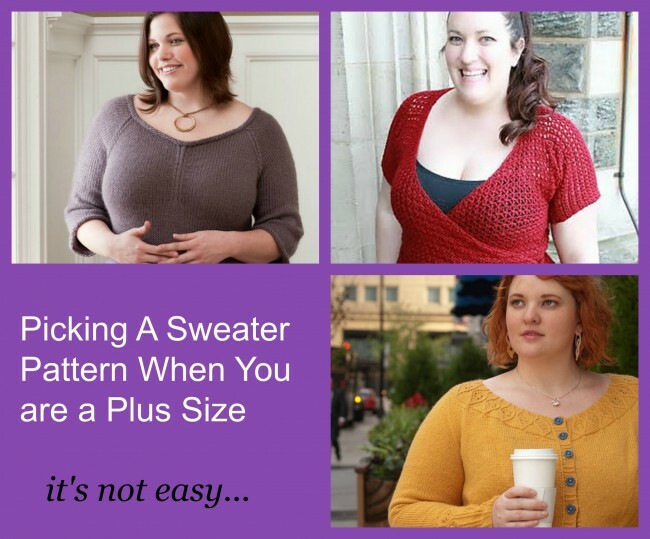 That’s what I look for in a good plus-size sweater pattern and here are some patterns that (kinda, sort of, mostly) fit the bill. I know I’ve been harping on cardigans and here is a pull-over. The rest are, in fact, cardis. But this is one pull-over that I actually like so I wanted to include it. It flatters. It has a perfect neck line, wide open with a nice V. The sleeves are tight at the top so the bust line is shown off and they don’t go much past the elbow. Plus its has that simple design element right down the center to draw your eye. Yep, I like this one. Make it in a solid color that you look good in, make it small enough to fit snug, and you will be happy with your new sweater. This one is almost perfect, just make your sleeves a bit shorter. But do everything else just the way Ysolda tells you to because this is a really nice cardigan. And I do mean everything. Notice how its buttoned? That lends emphasis to the top of the sweater. You should make this in a light colored solid to show off the twisted stitch motif at the neck line. Wear it with a darker shirt and you get some hour-glass shaping. Even the contrast-color buttons are done to purpose. You want that line drawing down the center. Amy Herzog is the author of Knit To Flatter, one of the first books written that invites knitters to pick their own sweaters and deisgns based on their body’s shape. It sort of set the bar for those few designers that are willing to design for the less than ideal body. The first half of the book explains how you can determine your own body’s profile/type and what you specifically need to look for in a pattern. I found it to be very helpful and I’ve re-read that part of her book several times. 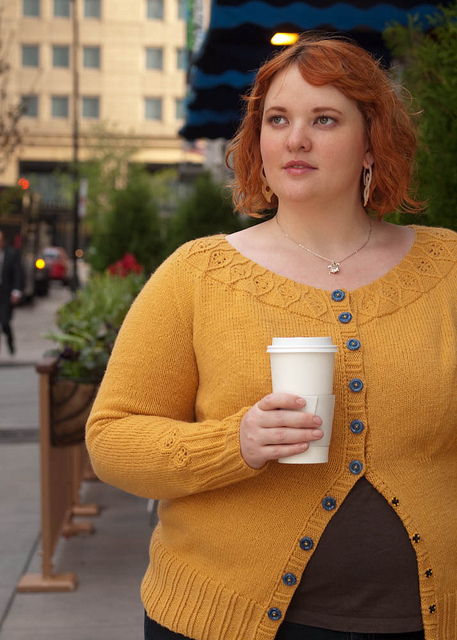 I was looking forward to it before it was even published because Amy had been designing knit wear for years that I always thought would look good on plus sized figures… even if they weren’t being photographed that way. Vignette by Amy Herzog. The official knitted sample is shown on the left, On the right is a larger version made by a ravelry knitter. I think this would be a good pattern for a plus sized woman. It does include some plus sizing, up to 54 inches in the chest. Notice the neck line? That’s a great V and if you leave it un-buttoned at the bottom, it will make an hourglass. The columns of eyelets on the front panels just emphasize your curves. If you try this one, make it to fit snug and that pattern will really work to your advantage. Vianne by Andi Satterlund. Designer’s sample is on the left and a ravelry knitter’s sweater is on the right. Here is another pattern that wasn’t photographed on a large model but I think it will work. The pattern is written to go up to 3XL. It has a V, it has the right sleeves, and its has pattern work to put an hour-glass on top of you. Wear it with something that contrasts and put on a row of eye catching buttons. Well. Now. 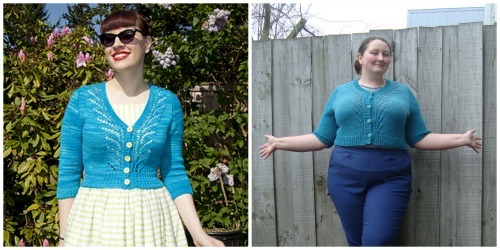 Its always a bit harder to come up with flattering sweaters in crochet but I think these two work very nicely. I would shorten the sleeves so you don’t have to push them up, but that’s a personal preference. I would also make it to fit a bit tighter all around to show off her figure. But as you can see, it has the right shaping, its buttoned to make an hourglass and that pretty detail work along the edges is there to highlight that effect. Make it in a solid color and wear it with something that contrasts just like this. A cross-over wrap which is so hard to achieve in knitting is easy in crochet. And its PERFECT for the plus size figure. Look at that neckline. Yep, that’s what you want. Lengthen those sleeves to three-quarter and I’d say its ideal. I Need To Make Room For New Yarn → ← Did you Win Something and Forget to Claim it??? 17 Comments on "Picking A Sweater Pattern When You are a Plus Size"
I thought you handled this well and was amused by the rack comment. Thanks to you I now am pretty interested in that Curvy Girl crochet book. That’s great! Hope you find a pattern in that book that works. Well all need another WIP right? Right. I have to agree with the majority of your thought on this subject. Presented nicely I have to say. The only one I disagree with is the pattern Vianne. Not flattering on most UNLESS you still have the hip curves without all the tummy. I thought of one more thing while rereading all of this again. On Lauriel, that is so unflattering the way it is buttoned or unbuttoned. If it were buttoned just 2 more past the waist would be better. Buttoned just to the waist only makes it appear too small for the hips. It should be buttoned like Vignette. As a relatively new plus size, I love you for this post! Great post! Very well written. Although I am a genetic through-back and am petite, most of the women in my family are plus size. They are always begging me to make them a sweater. I always graciously decline. Maybe this will offer some good choices and maybe give me the courage. There’s always that “appreciation” factor to consider. Too many stitches to become a dog or cat bed. I like some of those patterns for myself. Thanks again. You are very welcome! If the ladies in your family deserve handmade sweaters (not all do! lol beware!) than I hope this starts you on the path. Even better would be to put some yarn in their hands and teach them to stitch. But you know me.. I’m always trying to make a new crafter. Now if your belly is a true distraction (fyi I tend to belive that we have an inflated notion of our own flaws so I’m kind of skeptical about your belly, lol) then consider empire waist shapes. try putting the waist right under you bosom. and then wear something loose and flowy from there down. A shrug-type construction might work. I do tend to wear sweaters and Tops and dresses that are a high wasted style. Thanks.